United States District Judge Timothy Hillman on Wednesday announced the Federal Emergency Management Agency must continue it’s Transitional Sheltering Assistance (TSA) program for Hurricane Maria victims until at least July 23. This is the second hearing regarding FEMA’s announcement that they’d end the TSA program on June 30 after 10 months of providing assistance to 25,000 families. According to a statement released on June 27, FEMA made its decision based on the fact that 97 percent of Harvey, Irma and Maria victims who received assistance through the program have now found permanent housing. On June 30, LatinoJustice PRLDEF filed a temporary restraining order that would protect the approximately 1,744 Puerto Ricans who still rely on TSA. U.S. District Judge Leo Sorokin of Massachusetts granted LatinoJustice PRLDEF’s request and said FEMA cannot end the program until at least July 3 at midnight. A portion of the court document from LatinoJustice PRLDEF’s temporary restraining order. 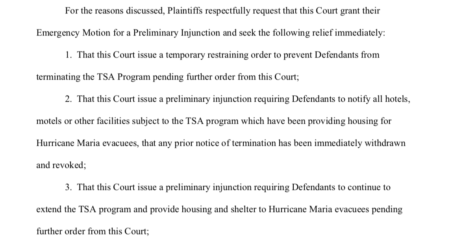 After Judge Sorokin’s announcement, FEMA said it’d extend the program until July 5 but refused to give any further statements because the agency does not comment on pending legal matters. In a lengthy statement, LatinoJustice PRLDEF manager of advocacy and digital strategy Christiaan Perez praised Judges Sorokin and Hillman’s rulings but said they’re only the first step in a larger lawsuit against FEMA. The group is calling on FEMA to continue providing housing assistance until every last hurricane victim has permanent housing. “It’s inconceivable that disaster victims have to continue to bring FEMA to court to force them to uphold their mandate and not discontinue the most basic aid to entire communities that have suffered through unimaginable disasters,” said LatinoJustice PRLDEF associate counsel Natasha Lycia Ora Bannan in the statement. “Fortunately, the court recognized the severity of the situation and the devastating consequences to evacuees who’ve already been displaced from their homes in Puerto Rico and is allowing them to stay in their hotels — a decision FEMA should’ve made on their own,” Bannan added. Hurricane Maria made landfall on Puerto Rico as a Category 4 on Sept. 20, 2017. In the months after the storm, the island’s infrastructure has yet to be fully repaired as many of the island’s residents still struggle with lack of access to clean water and reliable electricity. In October, the official death toll count was 48, but a study by Harvard University in conjunction with other institutions such as Carlos Albizu University in Puerto Rico revealed that the toll is actually closer to 4,645. The research team came to their conclusion after interviewing 3,299 randomly chosen households across the island about the number of co-habitants, related and otherwise, who died during and after the storm. Some of those deaths were directly caused by the storm, such as drownings during the storm surge. But some deaths are considered “hurricane-related,” meaning that the storm was the catalyst for other issues that impacted islanders’ health, such as lack of access to healthcare, unsanitary living conditions and extreme stress.